Cardiff missed the chance to move level on points with second-placed Derby as they were held to a goalless draw by Sheffield Wednesday in their Sky Bet Championship clash at Hillsborough. Neil Warnock's Cardiff side had Kenneth Zohore's goal disallowed after 12 minutes, and though they dominated for much of the first half, they had to be alert to fight off a barrage of chances from the Owls minutes before the break. The game turned on its head in the second half and Lucas Joao could not make the best of two gilt-edged chances as the hosts grew in confidence, although neither side was able to force a way through in the end. The stalemate sees Sheffield Wednesday stay in 17th place in the table, while the Bluebirds add another point to their tally as the Championship promotion race remains finely-balanced. 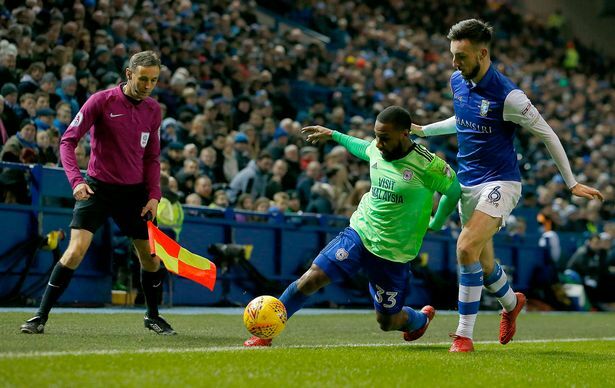 Cardiff did not look like a side who had lost four of their last five league games and were right to feel aggrieved inside 15 minutes when Zohore had a spectacular curling effort chalked off following a 50/50 challenge with Wednesday debutant Jordan Thorniley. The game was unspectacular for large periods, but it sparked into life in the final minutes of the first half as Jordan Rhodes headed over the Owls' best chance following a clever free-kick routine delivered by David Jones. Adam Reach also wasted a good chance when he sliced a volley over the bar following a rapid counter-attack two minutes later, before Sol Bamba atoned for misjudging Reach's cross with a last-ditch challenge to dispossess Morgan Fox at the far post. There was a lack of bite in the Cardiff play after the restart and they were almost punished for their creative deficiencies when Rhodes capitalised on Daniel Pudil's poor defensive header to release Joao, but the Portuguese dragged his shot across goal. The forward then headed another Rhodes cross straight at Joe Wildsmith shortly afterwards, before the subdued Yanic Wildschut volleyed against the stanchion at the opposite end of the pitch just after the hour. Wednesday substitute Marco Matias almost carved a chance of his own, latching onto Joao's pass just minutes after coming on, but Neil Etheridge read the chance like a book as Wednesday extended their run to six-and-a-half hours without a Championship goal. A typically tenacious performance from the 24-year-old at Hillsborough, although he should have done better with two huge chances either side of the hour mark. Sheff Wed: Wildsmith; Thorniley, Venancio, Pudil; Palmer, Jones(Capt), Reach, Wallace(Boyd 81), Fox; Joao(Nuhiu 81), Rhodes(Matias 72). Subs Not Used: Dawson(gk), Hunt, Pelupessy, Clare. Cardiff: Etheridge; Manga, Morrison(Capt), Bamba; Richards, Ralls, Grujic(Paterson 78), Bennett; Hoilett(Harris 83); Wildschut(Mendez-Laing 71), Zohore. Subs Not Used: Murphy(gk), Pilkington, Halford, Damour.